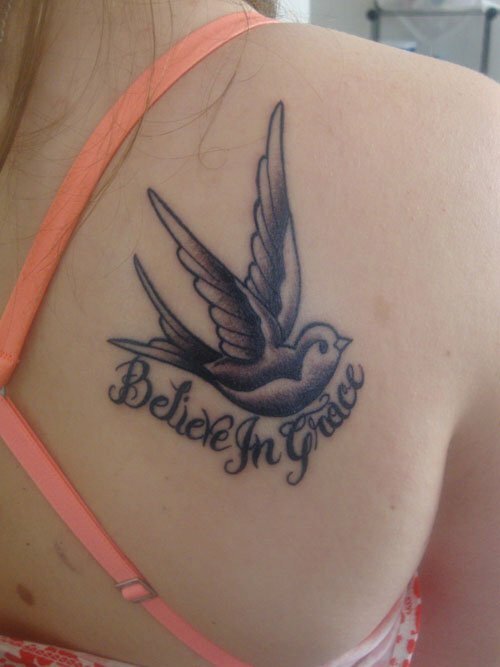 I very vividly remember getting my first tattoo. It was a bitterly cold day in February 2011, my sophomore year of undergrad. I was sitting in bedroom in my on-campus apartment (which I shared with five other ladies), when one of my roommates popped her head inside the door. I had already wanted a tattoo, so I quickly agreed. After deciding what we wanted and discussing how painful it might be (it really wasn’t painful – we were just scared), we (along with another roommate) jumped in the car and headed off to the tattoo parlor. Did I mention we drove there in the middle of a blizzard? 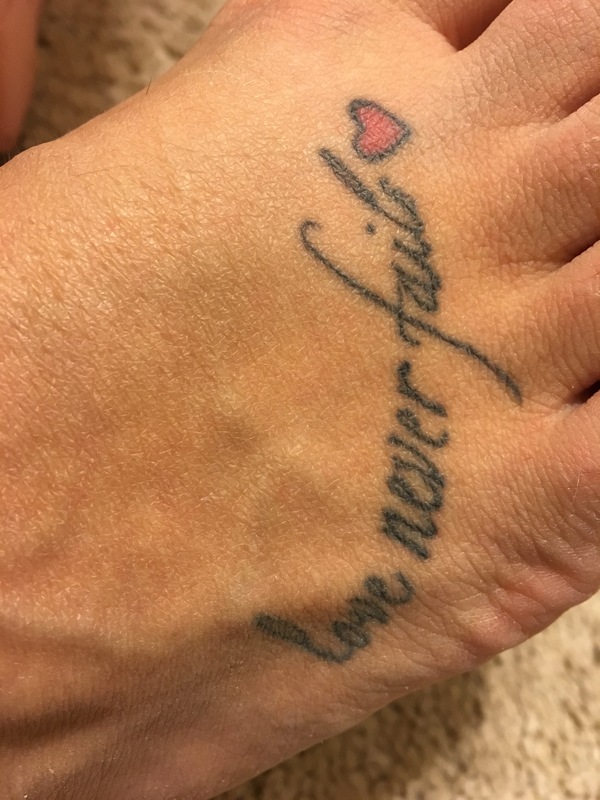 That was my first tattoo: “love never fails” written on my foot in script, with a small red heart next to it. 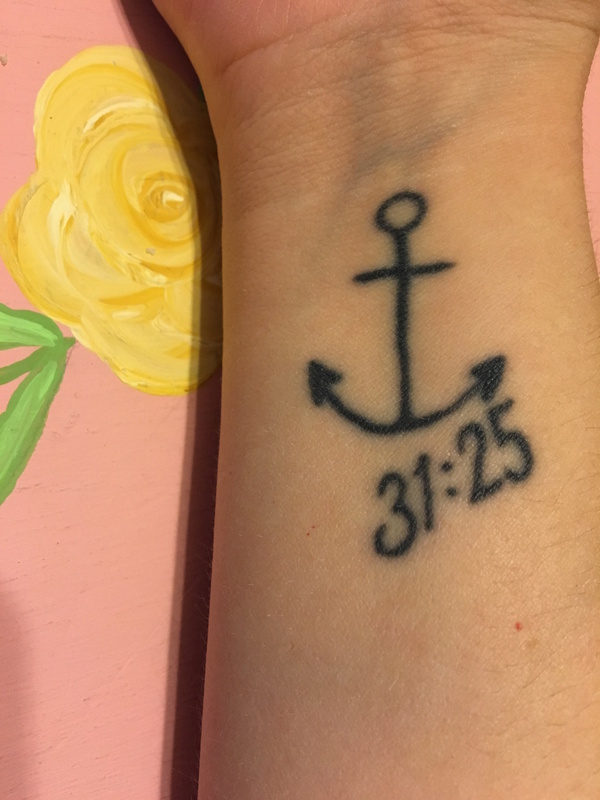 Although that phrase is from 1 Corinthians 13, I was going through a difficult time in my relationship, and it was a reminder to myself that God’s love is perfect and never fails – even though human love fails us constantly. 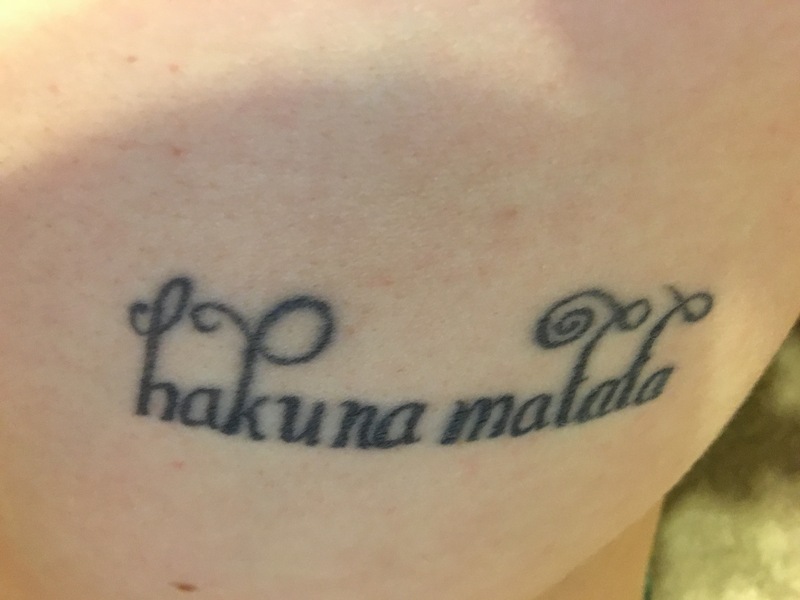 For me, there is an element of redemption in every tattoo. Each prick of the needle is a reminder that I have been permanently impacted by an event in my past, and that event has shaped who I am. I have overcome significant battles and, although I still struggle with the scars they’ve left on my heart and mind, I am better and stronger because of them. Tattoos are reminders of my victories, permanently embedded on my skin. They hurt for a fleeting moment, and what’s left is a beautiful scar that takes time to heal. They are carefully bandaged, protected, and softened with moisturizer. Slowly, over time, the old skin flakes off and a new skin is born – this one with a permanent reminder of our victories. Aren’t we much like tattoos? We were wounded, but others came and helped us heal, protecting us from the elements and reminding us who – and Whose – we are. 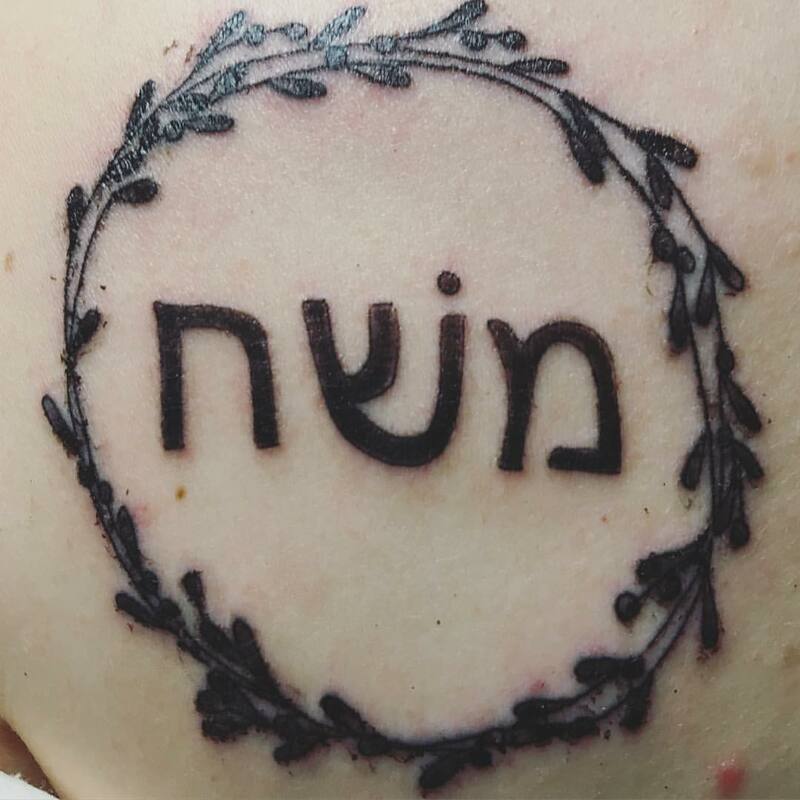 We end up becoming someone with a new, better, stronger skin – this one with a permanent reminder of what we’ve overcome. We are beautiful scars, living reminders of the moments that scarred us and the Redeemer that healed the pain. I think it’s important we don’t forget our struggles. In the moment, it’s hard to see anything but darkness and feel anything but pain. Yet, on the other side of the battle, we emerge victorious and realize just how strong we really are. Pain can grow us if we let it. The challenge is finding the light – grasping onto that flicker of hope amidst the blackest night. Cling to that hope – the hope and promise that He will redeem your story and make all things new. There is something beautiful about seeing how far we’ve come, don’t you think? I honestly cannot believe it has already been one year since I started taking classes with Fuller Theological Seminary. It seems like just yesterday I was choosing classes, ordering books, trying to figure out how online classes work (note: in most cases, you don’t actually have lectures you watch), and planning my first trip out to Orange County for an on-campus class. Over the past year I’ve faced challenges to my faith, traveled to Italy, made lots of new (and lasting) friendships, learned to sculpt, written lots of research papers, and made an incredible amount of new connections. I’ve learned I really love traveling by myself. My book collection has expanded immensely (ie: commentaries), I’m taking on even more school loan debt, and my friends suddenly think I’m a Biblical scholar (I assure you, I am definitely not). I’ve learned professors are more than just professors – they are friends, confidants, and people you actually hang out with outside of class. One of the most life-giving relationships I’ve made through school was with a professor. Although its been challenging, its been nothing but good, and I’m looking forward to what the next year has in store. Today I’m sharing some of my reflections on the past year, and I hope you find some tidbits you can apply to your life as well. Honestly, I had this really weird picture in my head of what seminary looked like or even was. I’m not sure what I was thinking, but I pictured this convent-esque looking building where only the most religious or scholarly folk went to become priests. And I pictured seminary being only for old people. I was wrong. To my surprise, my on-campus classes always consisted of mostly young adults in a similar place as me. It totally changed my perspective of what it means to be in seminary. We are just a bunch of like-minded people desiring to learn more about God and be challenged in our faith. And we also all spend a lot of time Google-ing definitions to words our professors or scholarly journals use (I was really happy to learn I wasn’t alone in that). …But you will get asked “So, do you want to be a pastor?” by friends and family (and strangers) on a regular basis. Once you say “I’m in seminary” and the person wipes the look of surprise off their face, they almost always ask if I want to be a pastor. No…I don’t. Even though I’ve had multiple people tell me they think I will be a pastor someday. If that where God calls me, that’s fine, but it is not on my agenda at the moment. But I can’t blame them for asking, because until I actually applied to seminary, I didn’t know you could be anything else. The people in my classes spread the gamut of jobs – pastors, missionaries, stay-at-home-moms, teachers, musicians, freelance writers, firefighters, artists, psychologists, nurses, models, CIA agents (no joke, there was a CIA agent in one of my classes). To be totally honest, I have no idea what I’ll end up doing with my degree. Actually, I don’t even know what degree I’m pursuing at the moment. But I still have some time before I have to figure it out. It’s OK to question your faith. It’s OK to question the Bible. It’s OK to question God. This was probably the biggest take away for me from this past year. One of the first classes I ever took in seminary was an in-depth study on the book of Esther. Let me tell you…that class was not at all what I expected. I expected lots of girl power, you-go-Esther-for-leading-Israel-as-a-woman type stuff. What I got was a lot of historical background on the Diaspora, the Second Temple period, the Persian empire, and lots of scholarly articles saying none of it was true. My professor also provided a lot of scholarly articles that said it was true, and they were equally convincing. So I found myself stuck in this place of what do I believe? Do I side with the people who have minimal evidence for the existence of Esther but still believe she and the story was real, or do I side with the people who tear apart that minimal evidence and believe it’s all just a story? That entire quarter, I wrestled with it. I wrestled with my long-time evangelical background, being raised to take everything in the Bible literally and not to question God’s Word. Did asking questions mean I didn’t believe in God? Did it mean I believed the Bible wasn’t true? Basically, I decided that although I love when archeological discoveries line up with what the Bible says, concrete proof isn’t required for me to believe something happened. Faith is belief that something is true without having evidence. Believing Esther is real requires faith. Plus, there are so many places in Israel and the Middle East that are not allowed to be excavated for religious or personal reasons…just think of what they would find if they dug there! Not having evidence doesn’t mean it didn’t exist – it just means we haven’t found it yet. It is absolutely OK to question God and question your faith. Heck, some of the most important leaders in the Bible openly questioned God and lived to tell the tale. Wrestling with God strengthens our faith; it doesn’t weaken it. If nothing else, seminary has taught me it’s OK to yell at God when you pray and ask hard questions. We’re broken people being real with Him. And He loves us for that. Sabbath rest is necessary…but you’ll have to force yourself to take Sabbath and make time for friends. Although we are constantly told to take a Sabbath and rest from work and school, this is legitimately hard to do as a student. There is always a book or article to read, a paper to write, an email to send, or something to discuss on the class forums. I can’t imagine all the other extracurricular things an on-campus student has going on. Sometimes it just feels like I am swimming in assignments and books with no time for anything other than school, and it seems if I took a break, I wouldn’t finish everything in time. In most cases, I don’t actually take time to rest, I just push through and become exhausted. But guess what? If you take time to rest, you will still get everything finished on time, because resting gives you the energy and fuel to keep going. Overworking yourself just leads to being tired, stressed out, saying “F#@! this!” and taking a nap instead. We can’t work if we are out of fuel. I heard recently that it is more important to be FINISHED, NOT PERFECT. This is hard for those of us Type-A personalities who want everything we do to be perfect. Sometimes it is more about just getting something finished, even when it’s imperfect. Sometimes it’s more important for your sanity to take the B- instead of an A+ (gasp). Sometimes it is more important to embrace imperfection so we can make time to rest. Now I make myself take time to rest and hang out with friends, even in the midst of finals and midterms. Community is vital and necessary for getting through the difficult times. Becoming a hermit and closing yourself off from friends just creates moments for the Enemy to creep in and tell you that you are alone, depressed, and unloved when it is just simply not true. Make it a point to spend time with God, both alone and with others. Ironically, my personal time with God has severely shrunk since starting seminary. I tell myself studying God and the Bible is the same thing as spending time with Him in quiet, but that’s not true. How can I minister to others if He isn’t the priority in my own life? Rest and abide in Him. It will change who you are as a person. This isn’t a bad thing. I’ve definitely changed since starting school. I’ve learned a lot, yes, but my beliefs have also changed a bit. For starters, I’ve become a bit more liberal. I no longer believe the Bible is inerrant – there are blatant contradictions in the Bible if you really want to go looking for them. Some stories are set in places that don’t make sense geographically, and reference animals that aren’t native to the place itself. Does this change my core belief that God is good and His Word is true? No. It just means I do a lot more historical research than I did before. Fuller is a non-denominational school and actually does a great job of showing both the liberal and conservative sides of an argument, letting the student come to their own decision on what to believe. Other seminaries are typically one-sided (ultra-conservative or ultra-liberal), so if you’re thinking about going back to school, make sure you explore their beliefs before enrolling. I’m thankful for Fuller and the options it provides us with. Also, I also actually enjoy reading commentaries now, and find myself buying books with controversial + radical arguments because I want to be challenged. I like books that give me something I can take away and use – not books with personal stories and emotional “fluff.” I like books based on facts. Prior to seminary, I hated these types of books, and would much rather prefer to read books appealing to my emotions. I’ve become much more academic/scholarly brained as opposed to the emotional feeler I used to be (although I am still very much an emotional feeler as well). Most of all, you will leave more confused than when you started. I came to seminary thinking I would get all of my questions about God, Jesus, and the Bible answered. I was wrong. Every answer brings another 10 questions with it. There is so much to learn and I don’t think an entire lifetime is long enough to learn it all, certainly not the 2-4 years most people spend in seminary. There are classes that exist on topics I didn’t even know existed (hello, Pneumatology, Ugaritology, and Akkadian). I’ll read a commentary looking to be told what a passage means, and find myself thinking this person has no idea what they are talking about after I read it. Want to be really confused? Read two different commentaries on the same passage. They will have opposite opinions and you’ll be left to figure out which one you agree with. But the confusion is worth it because it leads you back into conversation with your Creator, the One who has the answers and seeks to give them freely. Just make sure you’re going back to Him instead of getting frustrated and angry that you don’t understand. 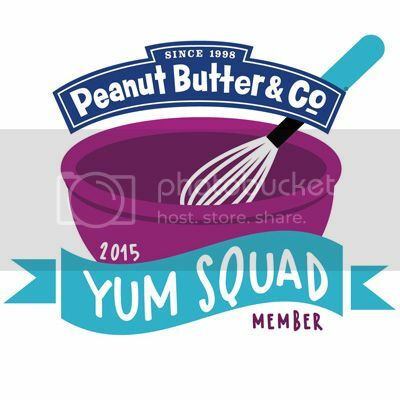 This post was a bit lengthier than normal – and for that I apologize. I hope you found something you can takeaway and apply to your own life. Seminary has been the most challenging, frustrating, and yet wonderful experience I’ve ever had… and I’m thankful I was able to share it with you.